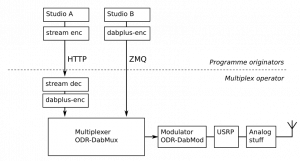 The DAB+ transmission chain composed of ODR-DabMux and ODR-DabMod and the Ettus Research USRP or LimeSDR software-defined radio platforms is a very interesting, flexible and low-cost way to set up a DAB+ transmitter. An encoder for DAB and DAB+ is available on ODR-AudioEnc. ODR-PadEnc can encode DLS and Slideshow as Programme Associated Data. Simplified DAB+ transmission chain with two audio programs. The ODR-mmbTools are a fork of the CRC-mmbTools whose development has ceased. Opendigitalradio pursues this development, and takes care to create a set of tools that are ready for production environments. Features: develop new functionality, protocols, interconnects, etc. The guide gives an introduction in the tools through step-by-step instructions. The sources of the guide are on github. and generates modulated I/Q data usable for transmission. It can directly interface the Ettus USRP devices, and can also be used with other SDR signal sources. ODR-AudioEnc contains a MPEG-1 Layer II audio encoder that is used to encode audio for the DAB standard and uses fdk-aac to encode for DAB+. ODR-PadEnc can read DLS from a text file and slides from a folder, and prepare the PAD data stream for injection into the audio encoder. The tools can be easily installed on a debian stable system following the install script. It is also possible to install the tools using the PyBOMBS recipes contributed by David Lutton. The release tarballs are available here.